The income support scheme announced by Piyush Goyal in the interim budget has similarities with Telangana’s Rythu Bandhu and Odisha’s Kalia schemes. 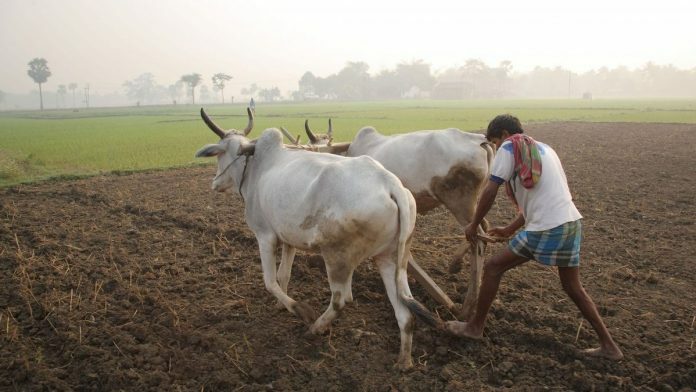 New Delhi: To alleviate rural distress, Finance Minister Piyush Goyal has announced an income support scheme for farmers amounting to Rs 6,000 yearly in the interim budget for the year 2019-20. The Pradhan Mantri Kisan Samman Nidhi, funded entirely by the central government, will cost the exchequer Rs 75,000 crore annually. Under this scheme, small and marginal farmers with holdings up to two hectares will get a direct income support of Rs 6,000 annually in three equal instalments. Around 12 crore farmer families will benefit from the scheme, which will be implemented retrospectively from 1 December 2018, Goyal said. Although the fine-print of the scheme is not yet available, it seems to be similar to Telangana’s Rythu Bandhu scheme and Odisha’s Kalia scheme. Income support will be the Narendra Modi government’s final attempt to appease farmers — a politically crucial voter base — ahead of the general elections due in April-May. The central government’s decision to provide sops to farmers follows the defeats of the BJP’s incumbent governments in Chhattisgarh, Madhya Pradesh and Rajasthan. Farmers’ ire was pegged as one of the major reasons for the defeats. “Agriculture continues to be the main driver of our economy. Agri production has been in record quantities. However, low international commodity prices have led to reduction in farmers’ income. There is a need to provide a structured income support to help them procure inputs like seeds and fertilisers while avoiding indebtedness,” Goyal said. A direct investment support scheme, Rythu Bandhu gives farmers income support of Rs 4,000 per acre for the two cropping seasons of kharif and rabi. The cash is paid directly into the bank accounts of the farmers, but lack of adequate land records across India makes this kind of scheme difficult for an all-India rollout. Ahead of the state elections, K. Chandrashekar Rao’s Telangana Rashtra Samithi government allocated Rs 12,000 crore in its 2018-19 budget for the scheme, and roared back to power with an increased majority. Odisha’s Kalia scheme promises Rs 10,000 per year to small and marginal farmers for taking up cultivation in the kharif and rabi season. It was announced in December 2018 with a Rs 10,000 crore outlay, to be spent over three years. The opposition ripped apart the government’s income support scheme. “The new scheme is intended to help the farmer, but in reality it will also help the absentee landlord. I would like to ask how the government will make the money reach the tenant-farmer and farm labourer who actually tills the land,” Congress leader and former finance minister P. Chidambaram said. He also questioned how the scheme will be funded, and what the government has done for the urban poor and non-farming poor. “I have no doubt in my mind that the Congress’ announcement of a Minimum Income Guarantee will bring true relief to all the poor households/families of the country, both farmer and non-farmer and both rural and urban,” he said. This article has been updated to include the opposition’s reaction to the scheme. This will provide some welcome relief to the most deserving rural families. However, the amount is exceedingly modest. With so much fiscal stress, buying the next election is just not possible.